1:00 used to be your “happy hour”. After trudging through the seemingly-never-ending morning, you were rewarded with naptime. Your little one was finally sleeping soundly and your house was quiet for the first time since way-too-early. It was blissful. 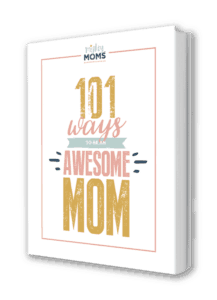 You knew you’d have a bit of time to rest, or get caught up on chores, so that you would be ready to put on your “mom hat” again once your tot woke up. Maybe it happened suddenly, or maybe it was a gradual process that kept you on your toes for a few months. Either way, your little one has stopped napping… and your quiet time has vanished into thin air. Suddenly you’re feeling (and looking) less like Wonder Woman and more like the damsel in distress. 1:00 looks no different from 10am or 3pm now. (Except maybe in regards to how many cups of coffee you’ve had by that point.) You feel completely exhausted and behind on chores by mid-afternoon because you haven’t had a break. You love your Captain Chatterbox but you’d give him a whole box of cookies right now if it meant he would stop talking for just. five. minutes. So, how do you get your beloved quiet time back? By introducing Quiet Time into the routine for your kiddo. Quiet Times are for kids who are over 3 years old and have learned basic safety skills (we don’t put things in our mouth, we don’t touch certain things, etc.). I would recommend still using your baby monitor to keep an eagle eye on the room while your child is playing! If your child is younger than 3 years old, and isn’t napping, set up a Sleep Session for a personal consultation with Certified Gentle Sleep Coach Amy Potts. Together, we can develop an effective sleep plan to help your child get the brain-sleep he so desperately needs! Sure, your little superhero may be done napping, but he still needs a strong dose of daily downtime. Downtime is essential for your growing child. It helps prevent him from becoming overstimulated and frazzled (aka turning into his own version of The Hulk). It’s also an opportunity for him to learn how to play independently, which means he is entertaining himself and learning to solve problems on his own. These are all immensely helpful skills for a child to learn. And, at the risk of stating the obvious, you need downtime, too. Instead of having your child nap, set aside time each day for quiet and independent play… which doubles as a bit of a rest for mommy. Win-win. Just as there are several different things you can call it – Quiet Time, Rest Time, Quiet Play, Mommy’s Break 😉 – there are also so many different ways that this time can look. And while you might have to tinker a bit to find the best setup for your family, here are a few tips that should help you get started. Remember: Your child isn’t the villain in this story. His rest during the day has been snatched away from him just the same. Don’t treat him as the enemy, rather treat him as your sidekick (the Robin to your Batman, if you will) to rescuing quiet time. You can’t save the world without a solid strategy, and you can’t rescue your quiet time without a plan. Use the following questions to brainstorm what your child’s quiet time should look like. Where will quiet time be? In her room? Maybe in the living room so she doesn’t wake a younger sibling? What time and for how long? When does she seem to really need a break? Many families find that doing quiet time when she used to nap is a natural time for a break. What is she allowed to play with? Are there any “rules” regarding potty breaks, etc. that need to be outlined? Your child has quiet time after lunch, in her room, for one hour. She has a special box of toys that are “approved” for quiet time. She can call for you if she needs to use the bathroom or if she has a problem (though she should try to solve the problem herself first). Be consistent. Kids thrive on routine; they like to know what to expect. So keeping to a similar schedule/setup for quiet time each day will ease the transition, especially at the beginning! If you don’t already have one, I would highly recommend using a baby monitor that connects to your phone as your Spycam. You want eyes in that room, my friend! Also, make sure that you’ve childproofed the area your child will be having a Quiet Time in. This means these doohickeys on all the plugins, and all the dressers and bookshelves are fully anchored to the wall, in case he decides to climb Everest. The key to a successful quiet time is an entertained child… but you shouldn’t be doing the entertaining. Putting together a box of special toys/books/games that are only used during quiet time can help keep your child’s interest. Bins and baskets are everywhere in the decorating world, which means you can find the right option for your needs. If you want something simple and functional, these plastic storage boxes come in lots of colors and are easy on the wallet. For something a bit more stylish, these striped bins have a fun pop of color. And if your child will have quiet time in the living room, these cotton cube bins are attractive enough to keep in plain view. Next, (and fairly obviously) fill it up! Choose activities that are quiet, somewhat contained, and don’t need parental involvement. Try rotating the activities and toys every week or so will to help the kids get excited about Quiet Times. They never know what they’re going to find! Plus, it means you can re-introduce older toys they forgot they loved! Or let your kids have ownership over the Quiet Time! Studies have shown that children are more likely to try something if they feel a sense of ownership over it. So involve your little one in the process! Let her choose some of the toys or books for her quiet time box, or even let her decorate the Quiet Time Box with stickers and washi tape in creative colors and patterns. Still feel like you need some Quiet Time Activity inspiration? Here are a few ideas to get you started! We’ve sung the praises of busy bags before, but let me sing them again: Busy Bags are really a perfect activity for quiet time. They’re typically simple and inexpensive to DIY so you can easily rotate in new bags to fit your child’s skills and interests. Check out these roundups at Coffee Cups and Crayons and The Activity Mom for some ideas and inspiration. Books are an obvious choice for quiet time, but choosing search-and-find books (like this one featuring Curious George) or books with engaging pictures (like this beautifully illustrated ABC book) can make it feel like a more independent activity for your child. Is your little man bored with Hungry Caterpillar? Check out these amazing toddler books you (probably) have never heard of, but will quickly fall in love with! This is also a time to try audiobooks, especially for your older preschoolers with longer attention spans. Audiobooks are a restful way to hear a story and engage their imagination in a way that physical books might not. Signing up for Audible.com is the cheapest way to download audiobooks you can use for years ahead (and future kids!). You pay a low monthly fee and get points to purchase audio books. You can try it here for free, and get a free downloadable audiobook! Here are several audiobook ideas for young children! For older toddlers (that no longer put small things in their mouth), this three-pack of wooden peg puzzles focus on alphabet, numbers, and colors. This box of four construction vehicle puzzles is a hit with my preschooler, and these spelling puzzles would be great for older preschoolers that are working on sight words. Quiet time should be… well… quiet. So leave the noisy cars and musical caterpillars for another time. Choose (and encourage your little one to choose) toys and activities that are quiet, engaging, and (ideally) educational. This is a time to really think through what will help your child succeed here. Unreasonable expectations could be his kryptonite: if it’s too hard in the beginning, he (and you!) might become too discouraged to continue. Having a clock in the room may keep him from asking you every five minutes if his time is up. This Ok to Wake! clock has over 1200 five-star parental reviews. Or maybe he needs five minutes playing with Mom in the beginning to help get his imaginative juices flowing. Having lunch or a snack right before quiet time can help fend off the “Can I have a snack?” questions. Rewarding your child for staying in his room for the entire time with a special snack or activity provides excellent motivation! Start with a short amount of time (15-20 minutes) and slowly add to it over a few days/weeks to help build up your child’s endurance! Most Quiet Times are about 60-90 minutes long. He stayed in his room the whole time. He played with the toys you provided. He did not write on the walls with a permanent marker he somehow found wedged under the back corner bookcase. You want him to feel empowered and encouraged! Eventually, you want him to look forward to Quiet Times every day! Nothing strikes fear into the hearts of moms everywhere like the words “dropped nap”. The transition away from an afternoon nap can leave you with a cranky child and a distinct lack of downtime in your day. You’ll help your child try to solve problems on their own. He will learn to play creatively and independently. Let’s help each other out! What are your best tips for establishing Quiet Time for your child?